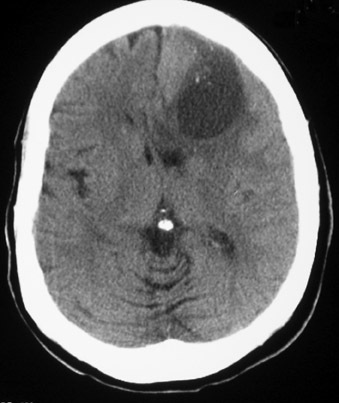 A CT scan of the head without intravenous contrast revealed a 3 × 5 cm complex cystic and solid mass in the left frontal lobe with surrounding edema that appeared to be an intra-axial mass (Figure 1). Punctate calcifications are identified within the mass. There is some associated mass effect on the suprasellar cisterns and there is subfalcine midline shift to the right. MRI of the brain T1-weighted and T2-weighted images (Figures 2 and 4, respectively) demonstrates the cystic component of the mass. Postgadolinium T1-weighted images (Figure 3) show extensive homogeneous enhancement of the solid portion of the mass. CT without contrast is sensitive to detecting small amounts of calcium, common to meningiomas, however, MRI with and without contrast, with its multiplanar capabilities, show improved accuracy in preoperative diagnosis and extra-axial location confirmation. 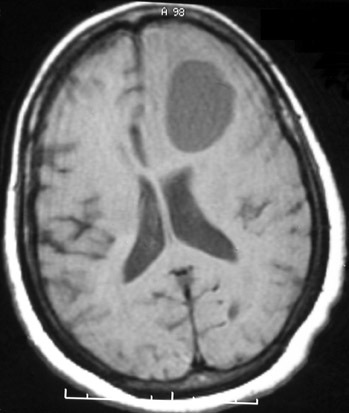 Cystic meningioma is a rare lesion and can often be misdiagnosed as other entities. Although CT has improved the ability to detect small amounts of calcium in menigiomas, MRI has been shown to have overall improved diagnostic accuracy in tumor diagnosis. 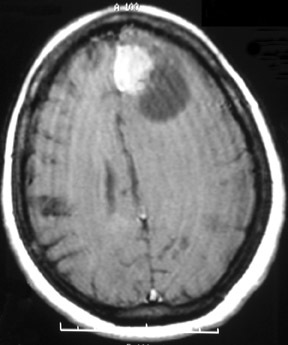 Carvalho G, Vorkapic P, Biewener G, Samii M. Cystic meningiomas resembling glial tumors. Surg Neurol. 1997;47:284-290. 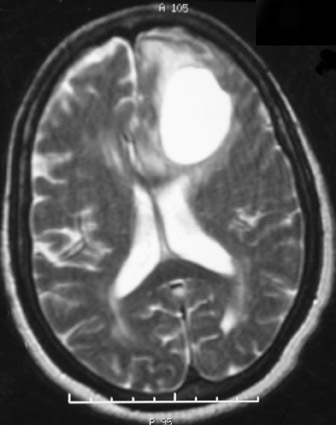 Umansky F, Pappo I, Pizov G, Shalit M. Cystic changes in intracranial meningiomas: A review. Acta Neurochir (Wien). 1988;95(1-2):13-18. Goyal A, Singh AK, Gupta V, et al. Suprasellar cystic meningioma: Unusual presentation and review of the literature.J Clin Neurosci. 2002;9:702-704. Zee, CS, Chen T, Hinton DR et al. Magnetic resonance imaging of cystic meningiomas and its surgical implications. Neurosurgery. 1995;36:482-488.